The Career Development Process begins with you. Everyone starts their process from different places. For many of you, you may be wondering where exactly am I? And if I don't know where I am, how do I proceed? Or, I know where I want to go, but how do I get there? 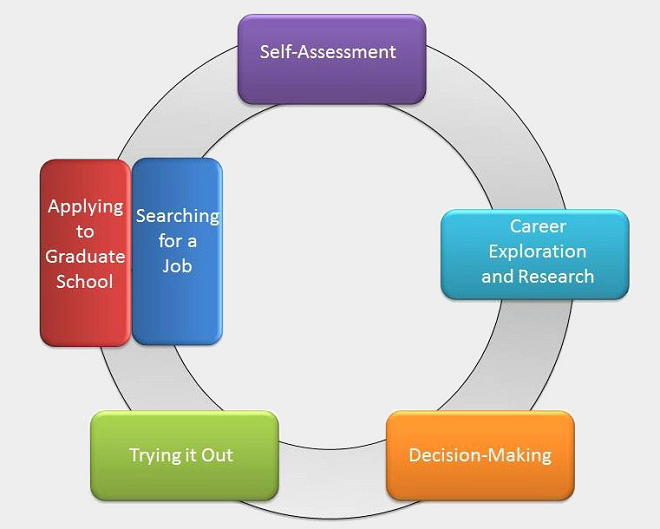 The process is NOT linear and you may find yourself cycling through the Career Development Process while in college and throughout your entire life. Let us help you successfully navigate the process. As you cycle through the Career Development Process at Buffalo State College, this timeline can be a useful guide to establish goals, make effective decisions, and gain employment and/or admission to graduate school. These are suggested activities to engage in your career development; the order in which you follow these guidelines is not sequential or absolute. For additional career advice and support, please contact the Career Development Center (CDC).